Chiang Mai’s aviation hub fortunes stall before take-off? Thai Airways International Public Company Limited announced the introduction of its Royal Transfer Service, whereby new Mercedes Benz cars will be used to transport first class passengers from their residence to Bangkok International Airport and vice versa. Kanok Abhiradee, THAI’s president, said that the airline is pleased to offer passengers a service that is more modern, convenient, elegant, and speedy. Therefore, THAI has introduced a new fleet of 100 Mercedes Benz cars, models E 220 CDI and C 180, which have entered THAI’s limousine fleet to serve passengers. 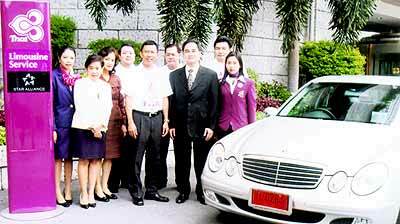 Pandit Chanapai (4th from left), Thai Airways International’s Thailand area director, and THAI’s management team welcomed Rienchai Likitplug (second from right) during THAI’s launch of its Royal Transfer Service, whereby new Mercedes Benz cars will be used to transport first class passengers from their residence to Bangkok International Airport and vice versa. THAI’s Royal Transfer Service is a new free Mercedes Benz service, transporting first class passengers without additional expense between their place of residence and Bangkok International Airport. With THAI’s Royal Transfer Service, first class passengers will have the option of choosing to use THAI’s limousine service when necessary. They can make reservations to use this service by calling THAI’s limousine department, tel. 0-2973-3191, 0-2973-3199, 0-2973-434 ext. 4121-2 (24 hours a day). One of THAI’s new limousines. THAI’s Royal Transfer Service and THAI’s limousine service are part of THAI’s premium customer services, THAI services with touches of Thai, and are special services that will facilitate THAI’s first class passengers. This service was introduced as part of the airline’s corporate identity strategy, supporting THAI’s goal to become the number one carrier, available to THAI’s first class passengers from this day forward. The much-vaunted vision of Chiang Mai as an aviation hub seems to have taken a nosedive. Vorapong Muchaotai, president of the Thai Hotels Association, Northern Chapter, said the THA would propose and promote a Visit Chiang Mai Year in 2007 project because the city is not ready to be announced as the aviation hub. Chiang Mai has also recently taken a drubbing from National Geographic magazine, which said the city was "getting ugly". The city’s tourism, cultural and natural charms were said to have deteriorated. From left: Vorapong Muchaotai, THA, Northern Chapter president; Pornchai Jitnawasatien, Chiang Mai Mayor Boonlert Buranupakorn’s secretary; and Deputy Governor Thongchai Wongrianthong. Hoteliers and government officials grappled with the (mis)fortunes of the city at the THA’s bi-monthly meeting on June 23. They were joined by Chiang Mai deputy governor, Thongchai Wongrianthong. One of the topics of discussion was better cooperation to improve Chiang Mai’s image as a leading tourism city. The numbers of flights in June fell from 150 to 100 because of the low and rainy season. This resulted in a 700 million baht reduction in the province’s revenue. Kanaphol Pinkaew, permanent secretary of Chiang Mai Provincial Administration Organization (PAO), said at the meeting that the more tourists and visitors to Chiang Mai, the more income that would be generated. He asked for part of that income to be spent on publishing "Kularb Lanna" or Lanna Rose, a new tourist guide book that contains more than 150 new tourist destinations, revising the Chiang Mai map and tourist spots. The PAO officials would also erect billboards and signboards with maps informing visitors of the tourism spots, as well as construct more public toilets. Rattaphol Naradisorn, the Chiang Mai Muang assistant district officer, said that the outdated 1935 laws regulating the hotel business should be amended to be in line with the current situation. Amendments to the Hotel Law, in fact, have been drafted already and will be submitted to Parliament for consideration. Even though she’s only 23, Sara Luis Hannan is already a world citizen. The daughter of Spanish and Irish parents, she graduated in biochemistry from Imperial College, London and worked in Sioux City American Theme Park, on the Spanish island of Gran Canaria. Now, the smiling senorita has proudly symbolized both the international character of Emirates and its dizzying growth, becoming the airline’s 5,000th cabin crew trainee to graduate and eager to provide the quality service that is the airline’s trademark. Sara has aviation fuel in her veins - her mother Annette flew with Laker Airways, her sister works for Airbus in Germany, and her teenage brother wants to be a pilot. Bilingual in Spanish and English, she was president of her university’s Spanish Society, secretary of its Irish Society, and treasurer of its biochemistry society. Now the time has come for her to spread her wings wider with high-flying Emirates. For careers information, visit www.emira tes group careers.com which offers a wealth of detail on Emirates. The Dubai-based international airline now serves 76 cities in 54 countries, and has earned more than 250 awards from satisfied customers. Thai Pacific Airlines has closed down sometime during the past few weeks owing money to staff and to its landlord. A senior ex-employee, on condition of anonymity, told TTG Daily News the final straw was when the owners of the office building where TPA tried to get started refused entry to staff until rent arrears were settled. "The phones have been cut off and the staff has gone. There’s nothing left," said the source. Attempts to contact TPA founder and president, Dr Wasant Singhamany, failed to get a response. In August last year Dr Wasant said, amid a fanfare of publicity, he planned to start a Bangkok-Sydney service on October 1, using a Boeing 747-200 aircraft. TPA’s managing director, Sawanit Singtoroj, said at the time the aircraft would be delivered into Thailand by mid-September. They are looking for 1.) Male - age around 50-55 years old, about 180 cm tall, big (not skinny), native English and basic Thai, to be Australian would be an advantage. 2.) another guy, but preferably half Thai, half foreigner, between 35 -45 years old, should be overweight, but look firm is an advantage. This role needs a height of at least 170 cm and the person has to be fluent in English and Thai.